Carbon monoxide poisoning is especially dangerous it is an odorless, colorless, and tasteless gas, making it extremely difficult to detect. Carbon monoxide poisoning quickly deprives the worker’s heart, brain, and other vital organs of oxygen and can cause employees to suffer permanent, debilitating injuries, or die. Many workers, such as police officers, firefighters, mechanics, and construction workers, face exposure to this toxic gas. Sadly, workers’ deaths and injuries could be prevented if employers followed federal safety guidelines designed to protect workers. What Steps Is Your Employer Required to Take to Reduce Your Risk of Carbon Monoxide Poisoning? Install a ventilation system to remove carbon monoxide from the air. Keep equipment and appliances that could emit carbon monoxide in good working condition to reduce the risk of a leak. Prohibit the use of gasoline-powered machinery in poorly ventilated work areas. Provide personal carbon monoxide monitors with an audible alarm to warn employees when there is a danger of exposure. Regularly test areas where carbon monoxide might be present. 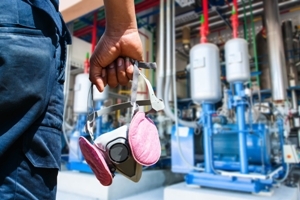 Use respirators with appropriate canisters when necessary to protect workers. Test a worker’s oxygen level before he is going into an area with possible carbon monoxide. Train workers in the dangers of carbon monoxide exposure, symptoms to watch for, and ways to reduce their risk of exposure. Even if your employer implements safety measures, you could suffer injuries due to carbon monoxide poisoning and need to file for workers’ compensation benefits. An experienced workers’ compensation attorney can help you obtain the benefits you deserve. Fill out our online form to schedule a free, no obligation consultation to learn about your legal options under New Jersey’s workers’ compensation laws. Could You Be Poisoned by Carbon Monoxide at Your Job?